Never before has architecture whisked me away to a fantasy world! Two days ago, I visited La Pedrera. Located in the L'Eixample neighborhood of Barcelona, La Pedrera is the creation of the brilliant architect Antoni Gaudí (1852-1926). I always thought Frank Lloyd Wright was a genius. But Gaudí has ten times the genius of Wright. Seven of Gaudí's creations have been designated as UNESCO World Heritage sites. Although many of Wright's creations have been nominated for the title, none of his buildings have received the prestigious status. Ventilation towers on the roof of La Pedrera. they are typically referred to as "helmeted sentinels." Gaudí believed that architecture is art and that art is best inspired by nature. Gaudí is famous for saying, "The great book, always open and which we should make an effort to read, is that of Nature." Though Gaudí designed for function, his architecture is full of imagination. His buildings are modern by today's standards, and so one can only imagine how radical they seemed when they were built more than one hundred years ago. When La Pedrera was first built, residents of the neighborhood were so appalled they thought its presence would lower their property values. If only they could have foreseen the true value La Pedrera! Built between 1906 and 1910, La Pedrera was commissioned by Pere Milà. Known as Casa Milà, Pere and his wife lived on the main floor of the building. They rented the remaining space to tenants to generate income. Though a good part of the building's space today is allocated to public tours, there are residents who reside on the middle floors of the building. Casa Milà was informally given the name "La Pedrera" (which means "The Quarry" in Catalan) because it resembles a large collection of stone. The street view of La Pedrera. My first impressions of the buildings included: lots of stone, undulating curves, organic shapes, and eye-catching wrought iron designs that resemble tangled seaweed. Gaudí's building was once described as a "stone poem." This is a perfectly apt description. A closer view of the exterior of La Pedrera. One fascinating factoid about La Pedrera is that it has a self-supporting stone facade. As there are no load-bearing walls, there is much flexibility as to how the interior walls can be utilized; walls can be added or eliminated without detracting from the building's stability. Cylindrical beams in each of the courtyards connect to radial beams (think of the hub and spokes of a bicycle wheel) to provide a central girder for the building. Brilliant! There are four sections to the tour of Gaudí's La Pedrera: the courtyards, the rooftop, the attic, and the apartment floor. When you first enter the building, you find yourself in one of the courtyards. The courtyards are open to the elements, encouraging fresh air to ventilate the building and fresh light to illuminate the interior rooms. Standing in one of the courtyards, looking up towards the open sky. Gaudí brought the out-of-doors indoors by incorporating plantings, regularly occurring shapes in nature, and earth'n'sky-toned paints on the walls and ceilings. A staircase in one of the courtyards. The rooftop was the section of the building I was particularly interested in. As you may recall from Here I Come, Barcelona!, as I was reading the Lonely Planet guide in preparation for my trip, I realized that the fantastical painting I had hung on my wall for many years was a real place -- La Pedrera! I was looking forward to seeing my painting in real life. My painting comes to life in the rooftop of La Pedrera. See Here I Come, Barcelona! to view a photo of my painting. Photos were difficult to capture on the rooftop. First of all, the place was crawling with visitors (aka prolific photo-bombers). In addition, unaesthetic safety fences and signs were sprinkled heavily across the rooftop. Fortunately, the fencing wasn't nearly as intrusive as it would have been had La Pedrera been located in the litigious-happy United States. When Gaudí designed the roof, he had functionality and asthetics in mind. He said, "Look around at all the other rooftops. They are ugly. It looks like they have strands of hair sprouting out of their heads." This is the view from the rooftop, across Passeig de Gràcia. the rooftops on those buildings are admittedly ugly. The view down to the street looks very model-like. Tiny plastic people. Tiny plastic busses. Tiny perfectly lush plastic trees. Gaudí designed thirty-eight separate structures for the rooftop. The structures are all architecturally functional -- they serve as skylights, stairwells, chimneys, and ventilation towers. The rooftop structures very much reminded me of the fairy chimneys I saw in The Magical Cappadocia, in Turkey. Some say that Cappadocia may indeed have been an inspiration, as Gaudí visited Turkey in 1885 to escape an outbreak of cholera in Barcelona. These sentinels are wearing helmets made of broken bottles. he often used old wine bottles, saucers, and cups in his work. Two structures on the roof have attached arches. to Sagrada Familia, a church designed by Gaudí. The attic is a unique space comprised of 270 brick arches. This was the area where the original tenants would wash their laundry and hang it to dry. The attic now houses various displays about Gaudí's life and work. As mentioned, Gaudi was inspired by nature. He believed that in nature, form was determined by practical function. Not only do forms serve to protect, restrain, and compress, but they also provide ergonomy and aesthetic elegance. The skeleton of a python provided inspiration for the attic of La Pedrera. A python's skeleton inspired the attic's structure. In determining the proper shape for the skeleton-like parabolic arches, Gaudí looked to mathematical and geometric principles. He used models of "catenary inversion" (stay with me here!) to determine the perfect shape. Gaudí suspended multiple chains of various lengths from the ceiling. Attached at two points, each chain formed a "catenary," or a curve at the base of the chain. By then inverting the chain's catenary curve, such that the arch was at the top instead of the bottom, Gaudí arrived at the optimal shape for each parabolic arch. An exhibit in the attic provided a marvelous visual of catenary inversion. The chains hanging from the ceiling demonstrate the catenaries, and the reflection in a mirror placed under the chains demonstrates the catenary inversions. This exhibit demonstrated the concept of catenary inversion. when viewed upside down, provides optimal arch structure. Thanks to the magic of mirrors, in the image above, the true brick arches of the attic are reflected as hanging arches in the mirror. Learning about catenary inversion reminded me of Mr. Dahl, my sophomore high school English teacher. In his classes, Mr. Dahl showed us gobs of slideshows from his visits to churches all across Europe. He explained that church buildings were designed to be figurative vessels, transporting mortals to heaven. Mr. Dahl showed us how, if you were to invert a church's arches, the arches would appear to form a boat's hull. In the photo above, notice how the inverted brick arches are similar to the hull of a boat. The final part of the the tour included a peek into one of the apartments, decorated as it would have been in the early 20th century. The apartment was damn nice for the bourgeoisie; I certainly wouldn't have minded such middle-class status back in the day. In Gaudí's era, it was common for architects to design more than just the building; they also designed furniture, light fixtures, and other features. 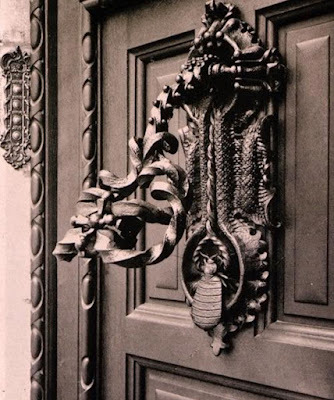 One of my favorite details of the La Pedrera apartment were the door handles. Gaudí designed handles that conformed to the contours of the hand. He did this by taking clumps of clay or plaster and squishing them together in his hands. This was the handle on the apartment's front door. would fit at the tip of the handle, similar to how you would hold a joystick. 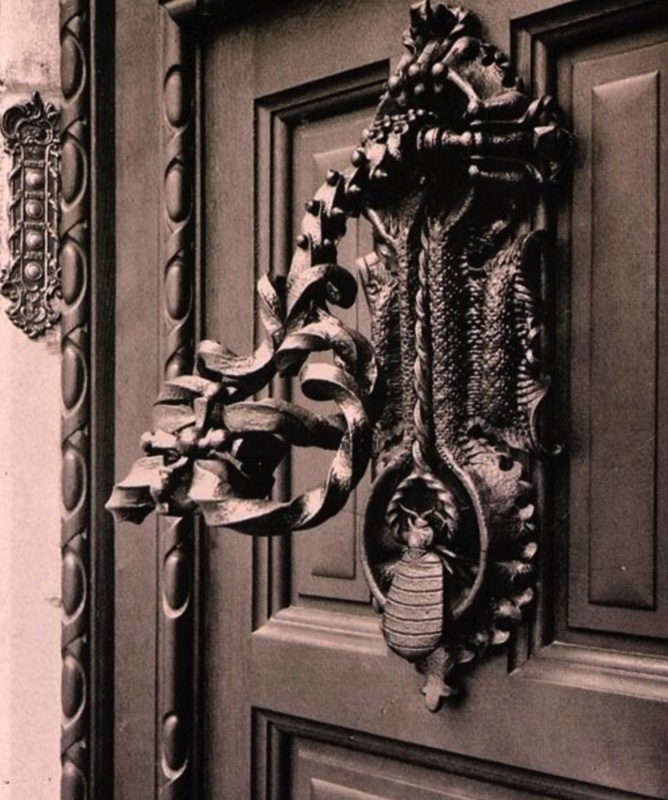 In another house, Gaudí designed a door knocker that would squish a bug every time there was someone at the door. Neato! I look forward to visiting two of Gaudí's other creations in the coming days -- La Sagrada Familia and Casa Battló. Well those sentinels are very much standing at attention!! Great photos! and love the history lesson. Even more so the analogy of the bike wheel, it made perfect sense to me after that. Glad you are having fun! More Gaudí architecture in forthcoming posts!